Showing results for tags 'new tiguan r'. *Courtesy of VW Vortex - See the full article and more pics here Spy pics of a Tiguan testing in Germany! And, despite the fact that there’s very little in the way of camouflage, this may be one of the Volkswagen Group’s most mysterious test cars! Whereas it usually goes for dazzle camo, VW has this time decided to go with conflicting information. What you see is clearly a Tiguan body, that much is clear, but what isn’t so clear is why there are so many Audi bits attached to it. Those oval tailpipes? Pure Audi Sport. The wheels? Audi. The Ingolstadt license plate is another Audi hallmark. And finally, the engine, we’re told, has the distinct sound of an inline 5. 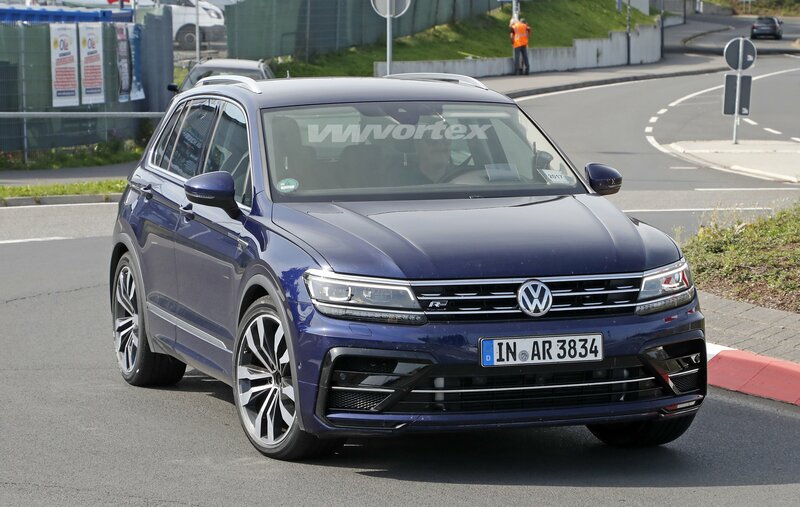 We’ve known that a Tiguan was testing with Audi’s engine since late August when a video emerged of the car testing at the Nurburgring. Back then, we thought it might be because the Tiguan would get that engine, but now the online consensus seems to be that this is an RS Q3 wearing an elaborate disguise. It wouldn’t be the first time that the VW Group went to such lengths. Volkswagen dressed up Atlas test cars like Jeeps and Kias when they were testing. They didn’t own the badges, though, so they couldn’t fully commit to the camo. With both vehicles owned by the same group, it could be that Audi just decided to follow through. It does make sense, meanwhile, that VW would plug a Golf R engine into a Tiguan R since the engine fits the chassis. Audi has been working with its Group-mates lately, though. Audi and Porsche have been using the same twin-turbo V6 and twin turbo V8 a lot lately, so the idea of the brand sharing its engine with VW isn’t farfetched. Notice the giant oval pipes make another appearance on a potential VW R... Whatever the case, we’ll continue to follow this story as it develops.